BAC Tactical | Want to know more about BAC Tacial - Read on! BAC Tactical is veteran owned and operated by former military, police and intelligence personnel. We have also worked in the private security sector in North America, Europe and the Caribbean for the last 14 years. During our operational careers we have worn a variety of bulletproof vests (we know the term is bullet resistant but bullet proof is a more commonly used term) in different climates and for long periods of time. What makes BAC Tactical stand out is that we have worked within a variety of organizations and have an understanding of the operational risks that go along with the various duties performed. We understand what equipment works and what doesn’t and you can trust us to only offer products that we truly believe in. We all know that body armor technology has come a long way, even within the last five years, which is exactly what was needed to be done. We are also sure that those of you who are reading this (with even a small amount of operational experience) can attest to – body armor of old was thick, heavy, uncomfortable, restrictive, bulky and hot! Luckily, technology has progressed and body armor manufacturers are now able to use new and innovative materials in order to bring to front-line workers ultra-thin and lightweight high performance bulletproof vests. Since entering the protective product sector we have gained a high degree of insight into new body armor technology and the materials used. We pride ourselves in being one on the very few companies that use the latest in Kevlar®, namely Kevlar® XP™ . 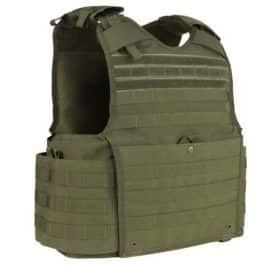 Kevlar® XP™ by DuPont feature a patented woven fabric technology that helps enable vests to weigh at least 10% less than those made with other commercially available technologies, and also offers more bullet-stopping power. This patented technology helps provides approximately a 15% reduction in back face deformation and superior ballistic performance in a 100% Kevlar® solution. What do we mean by the best bulletproof vest?